Samsung took the wraps off its new Galaxy Note 9 flagship last week, and while we’ve still got a few weeks to go until the phablet starts shipping to early buyers and showing up in stores, some fortunate early reviewers on the web have been lucky to get their hands on the device ahead of time. One of these pre-launch reviews was published by Tom’s Guide just hours after the Note 9 was announced, and focuses specifically on a spate of benchmark and other performance scores between the phablet and other recent flagships including Apple’s ten-month-old iPhone X. Interestingly, while the Note 9 is mathematically equipped with more powerful components, and more of them, Apple’s iPhone X still managed to put the brand-new Samsung flagship to shame — in most areas.. The Galaxy Note 9 is equipped with a massive 6.4-inch AMOLED display, runs Android 8.1 Oreo and is powered by Qualcomm’s latest Snapdragon 845 CPU — an Octa-core chip boasting two quad-core clusters clocked at 2.8 GHz and 1.7 GHz. The handset also features either 128 GB or 512 GB of onboard storage coupled with either 6 GB or 8 GB of RAM. In comparison, Apple’s iPhone X boasts a 5.8-inch Super Retina AMOLED display, runs iOS 11.4 with iOS 12 upgradeability, and is powered by Apple’s custom A11 Bionic CPU — a Hexa-core (6-core) chip clocked at 2.39 GHz. The iPhone X also includes Apple’s custom three-core GPU, although both 128 GB and 256 GB variants feature just 3 GB of RAM. On paper, it would certainly appear that the Note 9 has some major advantages over the iPhone X, including double the RAM and a faster, more expansive CPU. According to the benchmark scores published by Tom’s Guide, however, offering performance scores as measured by Geekbench 4, Apple’s nearly year-old flagship does circles around its latest competition. In comparison to other recent flagships like the OnePlus 6, Galaxy S9/S9+ and LG G7 ThinQ, Apple’s iPhone X scored an impressive 10,357. This, in comparison to the second-best performer, the OnePlus 6, at 9,088, and Samsung’s Galaxy Note 9 in third-place with 8,876. 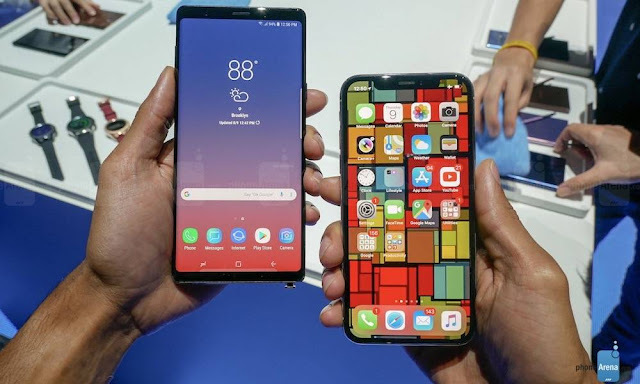 At 4,639, Samsung’s Galaxy Note 9 was once again outperformed by its competition — including the OnePlus 6, which came in first with a score of 5,124 — and Apple’s iPhone X, which came in second at 4,994. It’s not terribly surprising that the OnePlus 6, with its 8 GB of RAM, was able to slightly outpace the iPhone X in Slingshot Extreme scores — but in the performance department, it’s crystal clear, that even though the Note 9 is packed with power and mostly all of the latest technologies, the fluid nature of iOS and Apple’s custom silicon will always be a few steps ahead of the curve. While it was trumped on almost all fronts, the Galaxy Note 9 did manage to outperform the iPhone X in other key areas, such as in display performance testing, where Samsung’s AMOLED panel clocked in at an impressive 224 percent of sRGB color gamut. Apple’s iPhone X, in comparison, came in at just 128.6 percent. And moreover, the Note 9 scored top honors in display brightness, registering 604 nits in comparison to the iPhone X’s 574 nits. Keep in mind, of course, that these are merely Benchmark scores — they are not the Holy Grail of measuring real-world smartphone performance but are simply a quantifiable measure of raw speed conducted in a controlled environment. Still, these numbers don’t lie: the iPhone X, coupled with iOS, is a bonafide powerhouse to be reckoned with.. Until next month, at least.